At 6:00 on a weekday morning, Don Mullally is starting his three-hour show. 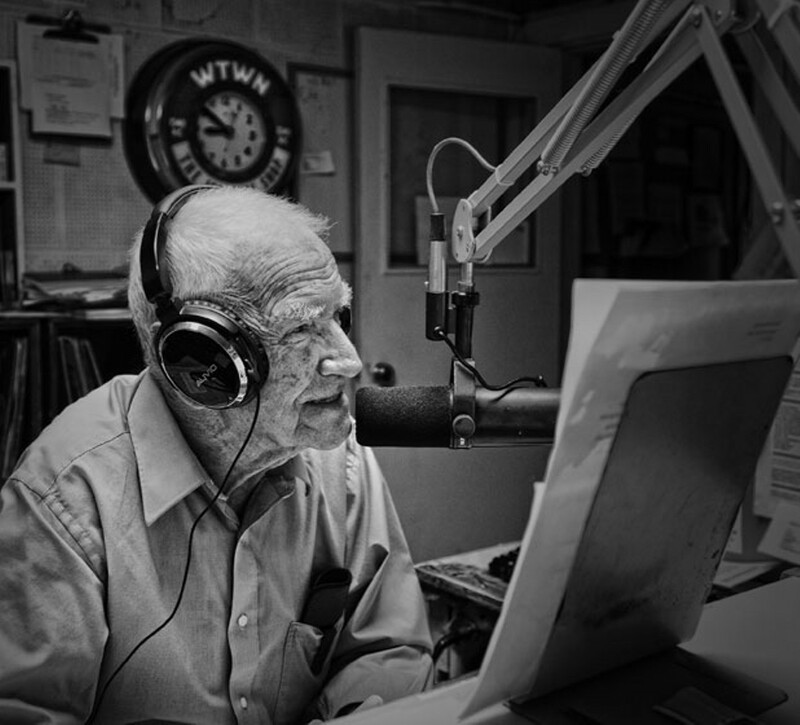 Settled into his chair in the cluttered basement studio of WSTJ-AM in St. Johnsbury, he reads news headlines of the day and a string of public service announcements, then flips on some canned music — or cues up vinyl on the turntable — with practiced ease. And he’s had a lot of practice: Mullally started at the station in 1952. He is now 83, and shows not the slightest inclination to slow down. Age has brought a slight quaver to his otherwise sonorous baritone, but when Mullally speaks, several generations of local listeners recognize him instantly. Long ago, he acquired the sobriquet “the voice of the Northeast Kingdom,” and no one is likely to inherit it: His is the only remaining live show on WSTJ. But for a few years off here and there — including two terms as a side judge — Mullally has been in radio for more than half a century. He’s earned his share of accolades and awards along the way, including one for Distinguished Service from the Vermont Association of Broadcasters. He was inducted into that organization’s Hall of Fame in 2001. Mullally isn’t just a disembodied voice on the radio; he’s a presence outside the booth, too. He was a singer in a local big band in his younger years, and an actor with the St. Johnsbury Players (“I’m just a ham,” he says about his stage time). He sings in the church choir and has been a director of the Caledonia County Fair forever. He’s also a member of just about every charitable organization in town. In fact, Mullally recently received a plaque honoring his perfect attendance for 31 years at the St. J Kiwanis Club. That’s a lot of commitment, especially because the organization’s Monday-night meetings rub up against his early bedtime. Though he’s worked pretty much every shift at WSTJ over the years, Mullally has manned the 6 to 9 a.m. slot, Monday through Friday, for more than a decade. He gets up at 3 a.m. to prepare and make his way to the station at the top of Concord Avenue. This bastion of hyperlocal radio is, to put it delicately, humble. The former cellar hole of a barn, it clings to a precipitous hillside, and its dark-red exterior echoes that of its past incarnation. The administrative offices are on the upper level, three cramped studios below — WSTJ is cheek-by-jowl with the Notch and Kix, rock and country FM stations, respectively. Mullally can see, and sometimes hear, his fellow morning DJs through glass panes in the walls between them. The Notch’s Ed Garcia can get a “little rambunctious,” Mullally says with grandfatherly indulgence. The décor here could be called vintage, but not in the trendy sense — nothing is new except the inevitable computers. The large, red analog clock in Mullally’s studio dates to the station’s early years, when original owner E. Dean Finney called it WTWN. Beneath the clock sits a plastic bin filled with CDs Mullally has brought from home — mostly the likes of Rosemary Clooney, Ella Fitzgerald and his favorite, Frank Sinatra. Mullally is visibly fond of WSTJ’s building and its history, showing a visitor around like he’s introducing a rumpled old friend. He steps outside to explain the original architecture of the building. Inside, he points out the wall beside the steep flight of stairs, filled with award plaques and framed documents; the tiny, windowless original studio; the bathroom, which someone has labeled “Studio X.” Long accustomed to the unpolished environs, Mullally seems not to notice the slightly buzzing fluorescent lights or disarrayed ceiling tiles overhead. What matters are the listeners he knows are out there — the microphone his link to their ears. On the air, it’s a little disquieting to hear this cheerful, kindly octogenarian obliged to utter lines such as “Herman Cain’s consensual sexual affair” — referring to the (former) presidential wannabe — or even reporting on some Vermont miscreant arrested for domestic violence or holding up a convenience store. But then, someone who’s been on the radio since Harry Truman was president has heard, and read, his share of unsavory stories. Even so, Mullally’s voice subtly relaxes when he ticks off numerous local events, such as a blood drive in Lyndonville — “all types are urgently needed!” — a toy collection for needy children in St. J., an open house at Pete’s Greens in Craftsbury or Santa’s arrival for an annual holiday celebration. No event is too insignificant. A church supper? Of course. He’ll even reveal what’s for dessert. Mullally seems to relish being the guy who tells listeners what’s happening in their world and, perhaps more importantly, in their smaller circle, defined by the 60-mile radius that WSTJ’s 1000 watts embrace. These goings-on are the lifeblood of a place, and almost no one cares for his place more than Don Mullally. State Sen. Jane Kitchel (D-Caledonia/Orange) feels much the same. “He was just sort of that voice,” she recalls of Mullally. Raised in a large farming family in Danville, she says, “We always had the radio on, so many of the cows in the area would have heard him, too.” Now 66, Kitchel has known Mullally for decades both on air and off. In turn, he’s followed her career with the keen interest he’s shown for every politician, from presidents to local officials. Though Mullally pointedly says he’s politically independent, he speaks with unabashed affection of Democratic Sen. Patrick Leahy. When the St. Johnsbury Chamber of Commerce named Mullally Citizen of the Year, in 1991, he received a special gift from the senator: a flag that had flown over the Capitol. Two years later, Leahy entered Mullally in the Congressional Record with a proclamation about his achievements. “Mr. St. Johnsbury” was born in West Somerville, Mass., Mullally reveals during an interview at his daughter’s home atop another of the town’s many hills. Mullally and his wife, Vel, moved in with Lynda Mullally-Baker in 1995. Their furry companions are a pug named Maxine, a shih tzu named Tyson and two cats, Muffin and Tina. Mullally explains that his parents moved to Montpelier when he was 5, and to St. J when he was 10. He attended elementary school there, and then St. Johnsbury Academy, but dropped out in 1946 to join the Navy. “I was a radio operator seaman for one and a half years,” he says, noting that his job was primarily telegraphy transmission. Though naval communication has nothing to do with commercial broadcasting, his radio foundation was an omen of things to come. And so Mullally’s radio career started off with “a little white lie,” his daughter teases. “I could always read and talk,” Mullally says with a shrug and mischievous grin. He eventually “graduated” to a day shift, created an interview show called “Viewpoint,” read news and those community announcements, and played music and Red Sox and Patriots games. As Leahy points out, Mullally also developed a reputation, along with Doug Drown, for delivering live commentary and analysis of local high school sports; the duo even traveled to away games. Mullally says he enjoyed keeping up with the kids. Of course, he and Vel had kids of their own — first Lynda, then Don Jr. and Michael — and, later, grandkids. Today, Don Jr. works at IBM in Essex. Michael works in the CT lab at Fletcher Allen Radiology. Lynda worked as a legal secretary for the Department of Housing and Urban Development in Washington, D.C., for 32 years, she says. When she finally returned home to Vermont, she tried several jobs and then spent 11 years at WSTJ herself, the last six of them with her dad. “We used to banter with each other,” she says. “We had such a good time.” Lynda left the station in 2008. Vel Mullally has compiled several scrapbooks — newspaper clippings, photographs, event programs and the like — chronicling her husband’s career. 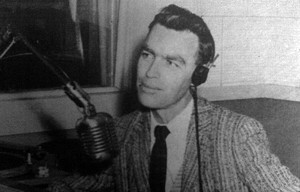 Don dressed in a dapper sports coat and tie, dark hair slicked back, on the air. Don on stage in a St. Johnsbury Players production. Don with the much taller Sen. Patrick Leahy. Don wearing a grass skirt, emceeing an event. “Dad would do anything for anybody; all you had to do was ask,” Mullally-Baker says. In Vermont, getting access to public officials was and still is pretty simple. “There is nobody of prominence in the Northeast Kingdom I haven’t talked to,” Mullally asserts. He’s also talked to all the state’s governors since the ’50s — except the current one. “I haven’t met Gov. Shumlin yet,” he concedes. Besides offering proof that people used to send thank-you notes, the many letters in Vel Mullally’s scrapbooks unfurl a whole spectrum of ways — from sports analysis to entertainment to grammar — in which her husband has touched people’s lives. So, when Mullally asked his son a question, Michael shot back, “‘I don’t know, why don’t you ask Michael Johnson?’” the younger Mullally says with a chuckle. When they attended shows Don booked at the Caledonia County Fair, “We used to sit right up on stage,” Michael says. A Chuck Berry concert was especially memorable — and so was his three-page rider with bizarre demands. Don Mullally corralled his kids for charitable works, too, such as staffing the phone banks during a Kiwanis fundraiser, or helping to clean the community swimming pool. His grandson’s appreciation only increased when, some 10 years ago, Don Mullally had a stroke. Actually, three: two little ones, followed by a major one. He was away from the radio for at least a year. “When people found out he’d had a stroke, it was like the king had died,” says Mullally-Baker. “It was constant letters, phone calls, cards, newspaper articles,” she goes on. “People just couldn’t imagine not hearing his voice.” While he recovered, Mullally-Baker handled the radio show on her own. Mullally tried to retire from WSTJ once, but it didn’t stick. The stroke didn’t keep him away for long, either.